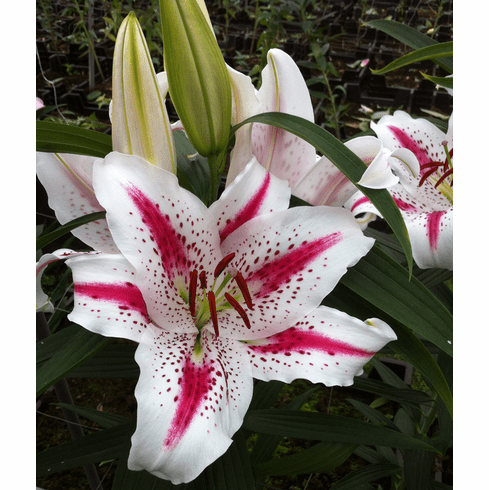 We simply love the rich cherry pink-red band in this lily and the spotting highlights of the same color. Bred in Holland, where for years breeders were doing everything possible to breed out spots for the cut flower trade, 'Cherry Swirl' brings back memories of the old Woodriff and Strahm lilies of decades past that fell from commerce with the passing of their creators. 'Cherry Swirl' flowers in Late July, has a sweet, yummy fragrance, and reaches about 4 feet. recommend planting in light afternoon shade in areas that typically see temperatures over 90 degrees F. day after day during summer.